is bliss...but not when putting technology to use on the farm. as soon as it drives off the lot, a plantâ&#x20AC;&#x2122;s yield potential starts declining from the moment the seed is planted. Tired of spending hours searching multiple auction websites to find specific pieces of farm equipment to buy? Kyle McMahon has an app for that. supporting biodiesel when the industry and farmers need it the most. For advertising information in the Iowa Soybean Review, please contact Larson Ent. LLC (515) 440-2810 or Dave@LarsonentLLC.com. Comments and statewide news articles should be sent to the above address. Advertising space reservations must be made by the first day of the month preceding publication. In consideration of the acceptance of the advertisement, the agency and the advertiser must, in respect of the contents of the advertisement, indemnify and save the publisher harmless against any expense arising from claims or actions against the publisher because of the publication of the content of the advertisement. 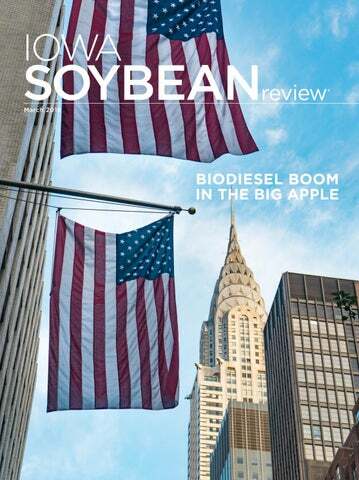 On the Cover: Industry leaders gathered in New York City recently to learn about biodiesel technology in the Big Apple. I'm also a bit overwhelmed by the pace of change and am challenged by the task of trying to decide what new tool is worth the cost, in both dollars and the time it might take to convert to the “new and improved.” Finally, I hope you take the time to read about the four Iowa farmers who are currently representing you as directors on the United Soybean Board (USB). The USB is the national checkoff board responsible for investing 50 percent of the dollars collected in the soybean checkoff program in Iowa and the rest of the states growing soybeans. These farmers are volunteers, appointed by the U.S, Secretary of Agriculture, who devote countless hours to make sure that the investments of these checkoff dollars have the biggest impact on soybean farmers. Biodiesel and Bioheat are two great examples of those investments. Enjoy the magazine and as always, let me know if you have thoughts or suggestions. and that good coming out.” Diane Ercse, Elk Run watershed coordinator and ISA resource management specialist, nominated Schleisman for the award. She says the Schleismans have hosted field days and Mark has spoken to other producers about how he has changed practices to improve water quality. "The work Mark and his family have done is inspirational. The diversity of conservation practices and pursuit of continuous improvement shout 'leader' to me,” says Ercse. “He has become more than a farmer concerned about his water quality. Mark is an advocate for the Elk Run and Raccoon River watersheds.” The Conservation Legacy Awards program is co-sponsored by ASA, BASF, Monsanto, Corn + Soybean Digest, the United Soybean Board/ Soybean Checkoff and Valent. Carol Brown can be contacted at cbrown@iasoybeans.com. within watershed planning groups could utilize their precision agriculture technology to locate the areas where crop losses are frequent, those acres might be put to better use. Farmers could save on expenses and possibly earn easement dollars from the Trust for voluntary environmental contributions. Collaboration could build success. The Iowa Soybean Association has partnered with the Iowa Water and Land Legacy Trust for several years, serving on the coalition’s executive board for the past two years. It’s imperative farmers have this seat at the table when the formula for spending what could be “sustainable, long-term funding” for Iowa’s natural resources is being discussed. This could be the year that tax reform legislation allows the Trust to be funded. Back in 2010, few farmers were comfortable with precision agriculture. We’ve come a long way. Using our field data to help determine how and where to best invest the Trust’s money could add value both to our farms and to the state’s resources. our farmer-leaders from across the state were recently assigned to United Soybean Board (USB) action groups in the areas of meal, oil and sustainability with a goal to help soybean farmers effectively differentiate their product and increase the value of U.S soy. Prioritize data Sifting through volumes of data can be overwhelming. Fulton says research collected from just one corn plant can yield 18.4 gigabytes of information, 39 different file types and 2,475 files of information for analysis. Mark Jackson plants into a rye cover crop last year. Technology like GPS guidance and Variable Rate have aided in farm operations but here also added data that needs to be managed. “The ability of growers to collect data today is pretty evident. There’s a lot of data and producing it is the easy part,” Fulton says. “The questions farmers must always ask is what is usable and brings value back to me? “Unfortunately, the answer is often ‘very little.’” Therefore, prioritizing data is critical if it’s to have tangible value for the producer. Fulton encourages farmers to narrow their field of vision by focusing on measurements and insights proven to have the greatest impact on profitability. They include soil sampling, base scouting, seeding rates, yield data and aerial imagery. Talking to other farmers is also a smart move, says Fulton. “Information shared between farmers is highly credible. Fortunately, farmers rarely hesitate to share what they know with other farmers and don’t shy away from admitting what works and what doesn’t work.” A survey by United Soybean Board found 92 percent of Midwest farmers are sharing data today, with 66 percent of respondents sharing data with two or more people. Fulton says this exchange of information is likely to increase as will consolidation of the ag data industry. Maximize value Nathan Paul, On-Farm Network® operations manager of cropping systems, says costs for acquiring data are decreasing. The trend will continue as more companies incentivize farmers to collect and share information. Farmers can maximize the value of data, Paul says, by: •	Understanding how information and data can benefit farm operations. Knowledge increases confidence. •	Remembering that no two fields are the same. Therefore, there’s no onesize-fits-all solution. Ask questions about the data that’s collected and what it can do for your farm. •	Inventorying historical data and identify information gaps. Is it soil test data that’s relevant or some historical imagery? •	Conducting your own on-farm research with the ISA or another provider. •	Asking even more questions. What have you tried? What worked? What didn’t work? •	Seeking to understand the experience of other farmers. Ask for their input and explore industry offerings. Some companies offer free trials or low-cost opportunities to use their services. •	Continually assessing the return on investment of software offerings. Is it worth the expense? Always be advised of the software fees and what’s included in the price (such as hardware, software and services packages). “If you identify a vendor and want to buy in, be sure to understand what their long-term plans are,” Paul adds. “Keep in mind that your data is a lot like working at a bank. Once you choose one, it’s not always easy to make a change. “But once you decide to benefit from ag data and choose a vendor you trust and are comfortable with, be prepared to commit to the long haul and trust the process. Information has value so put it to work on your farm.” Aaron Putze can be contacted at aputze@iasoybeans.com. Farmers' options for seed treatments have expanded to include fertilizer and micronutrients. the industry has grown to an expected worth of $9.82 billion by 2021. “The number of choices in seed treatments has exploded,” says Rich Stessman, operations manager for the Iowa Soybean Association (ISA) On-Farm Network®. “It used to be fungicides and insecticides were the standard. Now there’s several value-added products to apply, in addition to the bases, that address all kinds of issues. Even fertilizer and micronutrients are finding their way into the planter.” It stands to reason that early-planted soybeans have greater yield potential than late-planted soybeans. But the earlier the seed goes into the ground the more issues it could face. Cold, wet soil is a breeding ground for potential threats to the seed and its ability to grow. about online bidding (if available) and more is provided. •	A search bar to locate specific types of equipment. For example, a user can type in John Deere S670 combine. If one or more is available at an upcoming auction, lots will appear with corresponding data. •	Filter searches are available consisting of year, auction date, distance, hours of use, horsepower, etc. Tractor Zoom is working to make searches more specific. •	Farmers can “favorite” items of interest in upcoming auctions for future reference. “What I like about Tractor Zoom is it’s a simple product that everyone understands and sees a need for,” says Caitlin Zimmerman, the company's marketing manager. “The feedback so far is great.” Shawn Adam, a row crop and pig farmer from Batavia, downloaded the app. He wants to upgrade a tractor and combine. “It’s a lot easier than searching 16 auctioneer websites just to see what they have,” says Adam, an Iowa Soybean Association (ISA) member. “Time is money.” The app is free to download at the Apple App Store and Google Play. Currently, it’s also free for auctioneers to use. Information can be found at www.tractorzoom.com. Eventually, auctioneers will have to pay to use the site. Local advertising and some enhanced features are also part of future revenue plans. However, it will always be free for users to search for machinery auctions and equipment. Tractor Zoom staff attend farm shows, which included the recent Iowa Power Farming Show in Des Moines, to drum up business. They also contact auctioneers. The company is based in Valley Junction in West Des Moines. Approximately 2,200 people downloaded the app as of late January, according to company officials. About 48 auctioneers in Iowa, Minnesota and Illinois use the service and more than 4,500 lots have been advertised. “We’re starting to get good market penetration,” McMahon says. ISU connection The Tractor Zoom team, including Chief Financial Officer Zac Sandvig, are Iowa State University (ISU) graduates. The company is part of the ISU Startup Factory, which helps students, faculty and staff create businesses. Participants receive formal training, resources and access to a network of business mentors, advisors, counselors and investors. The company was awarded $25,000 proof of commercial relevance funding from the Iowa Economic Development Authority. Kyle McMahon, founder and CEO of Tractor Zoom, showcased the mobile and web-based app at the Iowa Power Farming Show and similar events in the Midwest. used farm machinery to be sold at auction. determining where cities are located and where certain plants and animals naturally exist. and environmental quality. Using state-of-the-art tools, the teams collect and interpret data from remote sensing, geographical information systems, global positioning systems, as well as plant, soil and water samples. Captured data is stored within secure ISA databases for annual reporting and sharing. ISA researchers have published numerous scientific papers in peerreviewed journals based on this collected data, which contribute to advancing the scientific state of knowledge on these topics. 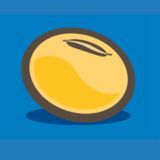 Much of this information is readily available on the ISA website: iasoybeans.com. cropping systems. Project topics include soil health, cover crops, nutrient management, nutrient loss, drainage water management; and edge-of-field practices such bioreactors and saturated buffers, oxbow restorations and pollinator habitat. The team has worked on thousands of farms and within watershed areas assessing natural resource conditions and evaluating practice performance. Farmers are continuously working to increase productivity and management efficiency, improving soil health and water quality and reducing negative impacts on the environment. Having information at hand that captures the variability and influences from geographic differences is of significant value. Farmers know one-size-fits-all management systems will generally fall short of acceptable performance. ISA Research teams will be working to compile findings from the past 17 years, while leveraging current programming. The team will put this information in the context of Iowa’s geographic landform regions. Roger Wolf can be contacted at rwolf@iasoybeans.com and Carol Brown can be contacted at cbrown@iasoybeans.com. to other Iowa soils, but drain poorly and contain numerous potholes. Iowa’s southern-most natural lakes are in the Des Moines Lobe, including Storm Lake, Blackhawk and Swan Lake. Iowan Surface: East of the Des Moines Lobe, this area includes gently rolling hills and cropland can be very productive due to good natural drainage. Southern Iowa Drift Plain: Southern Iowa is dominated by this landform, the largest of the landform regions. It was impacted by glaciers from 300,000 years ago and shaped by the cutting away of rivers. The landform contains hills and valleys mixed with grasslands and timber. Cropland is productive depending on soil conditions. Paleozoic Plateau: This landform in northeast Iowa is also known as the Driftless Area due to limited glacial activity. Limestone outcroppings characterize the area with rock formations that are 300-550 million years old. Topsoil is generally very shallow and farmers must make extra efforts to protect the land from water erosion. NBB Big Apple Tour The National Biodiesel Board held its annual Big Apple Tour in mid-December. Farmers and industry officials from across the country attended the three-day event, which highlighted current and future biodiesel and Bioheat® use in New York City and how soybean checkoff initiatives and education programs helped increase biofuel use in the nation’s largest city. Representing the Iowa Soybean Association (ISA) was Chief Operating Officer Karey Claghorn and Dave Walton, At-Large Board member. The following stories provide an overview of New York’s biodiesel use and support of biofuels, the trust emergency services have in biodiesel and training the next generation of heating technicians and BioHeat advocates. Soybean oil prices increased by 11 cents per pound, on average, from 2006-07 to 2014-15 due to biodiesel, according to a study prepared for NBB. Biodiesel increased soybean prices by nearly 63 cents per bushel, on average, and lowered soybean meal prices by $21 per ton, the study shows. Today, the city requires biodiesel in all its diesel vehicles. Only the fire and police departments are exempt from the rule, but each burns it anyway. Biodiesel blends range from B5 to B20, depending on the time of year. Some departments are testing B20 in the winter. New York City firefighters and emergency personnel respond to a pipe bomb explosion in Manhattan in December. The dieselpowered vehicles burn biodiesel. Photo Credit: Karey Claghorn. ew York City fire trucks and ambulances, with sirens blaring and lights flashing, rushed to Times Square Dec. 11 after a terrorist detonated a homemade bomb. Iowa Soybean Association (ISA) leaders, farmers and biodiesel industry officials were only blocks away when the attack occurred in a passageway under 42nd Street in Manhattan that connects a subway station and the Port Authority Bus Terminal. None of the group was hurt and only a handful of people, including the bombing suspect, sustained minor injuries from the explosion. New Yorkers depend on the fire department and emergency responders to save lives and property. Biodiesel powers hundreds of diesel vehicles to do it. Dave Walton, an ISA Board member from Wilton, says the prompt response and the magnitude of the emergency further proves biodiesel is a dependable product. diesel-powered police vehicles started to use B10 (10 percent biodiesel and 90 percent petroleum diesel) in the summer and B5 in the winter. The Fire Department utilizes B5 year-round, and a few ambulances are testing B20. Diamond admits he was skeptical about using biodiesel in the city’s nearly 350 fire engines and trucks and 300 ambulances due to reliability concerns. The longtime vehicle maintenance expert was worried about gelling in the winter and clogged filters. The transition to biodiesel, Diamond says, has been seamless. “There haven’t been any issues,” he says. “I would be the first to complain; I’m not shy. “When we started to burn ultra-low sulfur diesel, we had problems. But not with biodiesel,” he continues. “For us it’s all about keeping trucks and ambulances in service … we can’t have a failure. It’s all about keeping people safe.” The nation’s largest municipal fire department — only the Tokyo Fire Department is larger worldwide, according to the city — knows all about that. It serves more than 8 million residents within a 322-square-mile area. Whether it’s working around-theclock rescuing people from the World Trade Center or responding to the latest terrorist attack in Times Square to a fouralarm apartment fire or an ambulance call for a health problem, Diamond says every emergency is important. “We truly thank God for firefighters every day,” he adds. New York City’s 4,400 emergency medical technicians and paramedics (fire inspectors are included in that number) responded to 1.75 million calls last year, according to department data. More than 11,000 firefighters went out on about 590,000 emergency and nonemergency calls. Andy Diamond, left, executive director of fleet operations bureau of fleet services for the New York City Fire Department, talks about the reliability of biodiesel during the National Biodiesel Board Big Apple Tour in December. Photo Credit: Matthew Wilde. benefits of biodiesel (helps farmers, good for the state economy, improves engine lubricity, etc.). But he often gets pushback due to a lack of trust. “Now, I can say to them if New York trusts it to protect their citizens, then it’s good enough for your tractor, bus and truck,” Walton says. “Fire department mechanics here will see more use in one piece of equipment than a farmer will see in a lifetime. We’re talking fire trucks and ambulances going on calls and idling for hours on end every day.” Since biodiesel can have a cleansing effect on engines, performance problems for new users can be greatly reduced or eliminated by changing filters more regularly, at least initially, and abiding by storage tank best maintenance practices. National Biodiesel Board CEO Donnell Rehagen says New York City leads by example by using biodiesel in emergency vehicles. “I’m not sure we can find a better advocate,” he adds. Matthew Wilde can be contacted at mwilde@iasoybeans.com. Association Board member and Wilton farmer. “The push for the future will be higher inclusion rates, which will create instant demand. “Any increase in biodiesel use likely means more demand for soybean oil, which adds value to soybeans,” he continues. “The heating oil market is huge here.” New Yorkers burn more than 1 billion gallons of heating oil annually, government statistics show. The market share for heating oil has eroded over the years to about 30 percent. Bioheat is the future of the industry, heating oil officials say, as customers demand cleaner-burning alternatives. Technicians, which are in short supply, who believe in it are essential as well. Lacertosa convinced a dealer to donate about 150 gallons of biodiesel to the school three years ago so HVAC students could become familiar and work with the product. The heating oil association has been involved ever since. HVAC Instructor Peter Gonzalez, a licensed technician and owner of Gonzalez Heating Co., is teaching burner and furnace/boiler maintenance, combustion, fuel storage, piping and other aspects of the job. Bioheat is often part of the curriculum. About 28 students typically start the program as sophomores. Graduates have enough skills to enter the workforce as entry-level technicians. “Companies are begging for workers,” Gonzalez told the group. “The future of the industry is the biofuel you produce.” Peter Gonzalez, second from right, HVAC instructor at the Bronx Design and Construction Academy, tells participants of the NBB's Big Apple tour that students learn about the value of Bioheat as a fuel source. Photo Credit: Matthew Wilde. Matthew Wilde can be contacted at mwilde@iasoybeans.com. physical strain might slow him down a little bit for the first time in his life. The fatigue of chemo is a reality that will have to be dealt with. My dad didn’t choose to be a farmer; he was born to be a farmer. My mother, intelligent and beautiful, could have become anything she wanted. Yet, she chose agriculture by choosing my dad. Their life became an adventure of the unknown – marked by the seasons of sowing and reaping. I am lucky to be a farmer’s daughter. It’s pretty simple — I love agriculture because I love my dad. I do what I do because it’s the life he created for his family. It’s hard to put into words the emotions I’m feeling during this time. But I don’t really have to. My story is everyone’s story. Who among us hasn’t been impacted by cancer or tragedy? Who hasn’t mourned the changing path of life? Not because we are afraid of the future, but because we are insightful enough to cherish the life we get to live. This is our story — the story of agriculture. Change and challenges are apart of who we are and will only make us stronger in the years to come. EVERY SPRING WE GET TO DEMONSTRATE HOW A COOPERATIVE WORKS. THIS YEAR OUR ELIGIBLE CUSTOMERS WERE PAID $200 MILLION IN CASH-BACK DIVIDENDS. We are owned by the customers we serve. That means they get a share of our earnings â&#x20AC;&#x201C; cash-back dividends that benefit their operations and support their communities. Since 2004, FCSAmerica has paid more than $1.5 billion to our customer-owners. Learn more by visiting powerofownership.com or call 800-884-FARM. Industry leaders gathered in New York City recently to learn about biodiesel technology in the Big Apple.